1 A None No Power Seat 1 A is a standard flat bed Royal Laurel Class seat. There is a closet located directly in front of this seat, which may be convenient to place and store personal items. 1 D None No Power Seat 1 D is a standard flat bed Royal Laurel Class seat. There is a closet located directly in front of this seat, which may be convenient to place and store personal items. 1 G None No Power Seat 1 G is a standard flat bed Royal Laurel Class seat. There is a closet located directly in front of this seat, which may be convenient to place and store personal items. 1 K None No Power Seat 1 K is a standard flat bed Royal Laurel Class seat. There is a closet located directly in front of this seat, which may be convenient to place and store personal items. 10 A None No Power Seat 10 A is a standard flat bed Royal Laurel seat. 10 D None No Power Seat 10 D is a standard flat bed Royal Laurel seat. 10 G None No Power Seat 10 G is a standard flat bed Royal Laurel seat. 10 K None No Power Seat 10 K is a standard flat bed Royal Laurel seat. 11 A None No Power Seat 11 A is a standard flat bed Royal Laurel Class seat however, noise from Elite Class may be bothersome as there is a bassinet positioned behind this seat. 11 D None No Power Seat 11 D is a standard flat bed Royal Laurel Class seat however, noise from Elite Class may be bothersome as there is a bassinet positioned behind this seat. 11 G None No Power Seat 11 G is a standard flat bed Royal Laurel Class seat however, noise from Elite Class may be bothersome as there is a bassinet positioned behind this seat. 11 K None No Power Seat 11 K is a standard flat bed Royal Laurel Class seat however, noise from Elite Class may be bothersome as there is a bassinet positioned behind this seat. 2 A None No Power Seat 2 A is a standard flat bed Royal Laurel seat. 2 D None No Power Seat 2 D is a standard flat bed Royal Laurel seat. 2 G None No Power Seat 2 G is a standard flat bed Royal Laurel seat. 2 K None No Power Seat 2 K is a standard flat bed Royal Laurel seat. 20 A None No Power Seat 20 A is a recliner Premium Economy Class seat that may have limited legroom due to positioning of the bulkhead wall ahead. The tray table is in the armrest making the armrest immovable and slightly reducing seat width. There is no floor storage during takeoff and landing. This is a bassinet position so passengers with infants are often seated in this area. 20 C None No Power Seat 20 C is a recliner Premium Economy Class seat that may have limited legroom due to positioning of the bulkhead wall ahead. The tray table is in the armrest making the armrest immovable and slightly reducing seat width. There is no floor storage during takeoff and landing. This is a bassinet position so passengers with infants are often seated in this area. 20 D None No Power Seat 20 D is a recliner Premium Economy Class seat that may have limited legroom due to positioning of the bulkhead wall ahead. The tray table is in the armrest making the armrest immovable and slightly reducing seat width. There is no floor storage during takeoff and landing. This is a bassinet position so passengers with infants are often seated in this area. 20 E None No Power Seat 20 E is a recliner Premium Economy Class seat that may have limited legroom due to positioning of the bulkhead wall ahead. The tray table is in the armrest making the armrest immovable and slightly reducing seat width. There is no floor storage during takeoff and landing. This is a bassinet position so passengers with infants are often seated in this area. 20 F None No Power Seat 20 F is a recliner Premium Economy Class seat that may have limited legroom due to positioning of the bulkhead wall ahead. The tray table is in the armrest making the armrest immovable and slightly reducing seat width. There is no floor storage during takeoff and landing. This is a bassinet position so passengers with infants are often seated in this area. 20 G None No Power Seat 20 G is a recliner Premium Economy Class seat that may have limited legroom due to positioning of the bulkhead wall ahead. The tray table is in the armrest making the armrest immovable and slightly reducing seat width. There is no floor storage during takeoff and landing. This is a bassinet position so passengers with infants are often seated in this area. 20 H None No Power Seat 20 H is a recliner Premium Economy Class seat that may have limited legroom due to positioning of the bulkhead wall ahead. The tray table is in the armrest making the armrest immovable and slightly reducing seat width. There is no floor storage during takeoff and landing. This is a bassinet position so passengers with infants are often seated in this area. 20 K None No Power Seat 20 K is a recliner Premium Economy Class seat that may have limited legroom due to positioning of the bulkhead wall ahead. The tray table is in the armrest making the armrest immovable and slightly reducing seat width. There is no floor storage during takeoff and landing. This is a bassinet position so passengers with infants are often seated in this area. 21 A None No Power Seat 21 A is a standard recliner Premium Economy Class seat, however, this seat is missing a window. 21 C None No Power Seat 21 C is a standard recliner Premium Economy Class seat. 21 D None No Power Seat 21 D is a standard recliner Premium Economy Class seat. 21 E None No Power Seat 21 E is a standard recliner Premium Economy Class seat. 21 F None No Power Seat 21 F is a standard recliner Premium Economy Class seat. 21 G None No Power Seat 21 G is a standard recliner Premium Economy Class seat. 21 H None No Power Seat 21 H is a standard recliner Premium Economy Class seat. 21 K None No Power Seat 21 K is a standard recliner Premium Economy Class seat, however, this seat is missing a window. 22 A None No Power Seat 22 A is a standard recliner Premium Economy Class seat. 22 C None No Power Seat 22 C is a standard recliner Premium Economy Class seat. 22 D None No Power Seat 22 D is a standard recliner Premium Economy Class seat. 22 E None No Power Seat 22 E is a standard recliner Premium Economy Class seat. 22 F None No Power Seat 22 F is a standard recliner Premium Economy Class seat. 22 G None No Power Seat 22 G is a standard recliner Premium Economy Class seat. 22 H None No Power Seat 22 H is a standard recliner Premium Economy Class seat. 22 K None No Power Seat 22 K is a standard recliner Premium Economy Class seat. 23 A None No Power Seat 23 A is a standard recliner Premium Economy Class seat. 23 C None No Power Seat 23 C is a standard recliner Premium Economy Class seat. 23 D None No Power Seat 23 D is a standard recliner Premium Economy Class seat. 23 E None No Power Seat 23 E is a standard recliner Premium Economy Class seat. 23 F None No Power Seat 23 F is a standard recliner Premium Economy Class seat. 23 G None No Power Seat 23 G is a standard recliner Premium Economy Class seat. 23 H None No Power Seat 23 H is a standard recliner Premium Economy Class seat. 23 K None No Power Seat 23 K is a standard recliner Premium Economy Class seat. 24 A None No Power Seat 24 A is a standard recliner Premium Economy Class seat, however, this seat is missing a window. 24 C None No Power Seat 24 C is a standard recliner Premium Economy Class seat. 24 D None No Power Seat 24 D is a standard recliner Premium Economy Class seat. 24 E None No Power Seat 24 E is a standard recliner Premium Economy Class seat. 24 F None No Power Seat 24 F is a standard recliner Premium Economy Class seat. 24 G None No Power Seat 24 G is a standard recliner Premium Economy Class seat. 24 H None No Power Seat 24 H is a standard recliner Premium Economy Class seat. 24 K None No Power Seat 24 K is a standard recliner Premium Economy Class seat, however, this seat is missing a window. 25 A None No Power Seat 25 A is a standard recliner Premium Economy Class seat. 25 C None No Power Seat 25 C is a standard recliner Premium Economy Class seat. 25 D None No Power Seat 25 D is a standard recliner Premium Economy Class seat. 25 E None No Power Seat 25 E is a standard recliner Premium Economy Class seat. 25 F None No Power Seat 25 F is a standard recliner Premium Economy Class seat. 25 G None No Power Seat 25 G is a standard recliner Premium Economy Class seat. 25 H None No Power Seat 25 H is a standard recliner Premium Economy Class seat. 25 K None No Power Seat 25 K is a standard recliner Premium Economy Class seat. 26 A None No Power Seat 26 A is a standard recliner Premium Economy Class seat. 26 C None No Power Seat 26 C is a standard recliner Premium Economy Class seat. 26 D None No Power Seat 26 D is a standard recliner Premium Economy Class seat. 26 E None No Power Seat 26 E is a standard recliner Premium Economy Class seat. 26 F None No Power Seat 26 F is a standard recliner Premium Economy Class seat. 26 G None No Power Seat 26 G is a standard recliner Premium Economy Class seat. 26 H None No Power Seat 26 H is a standard recliner Premium Economy Class seat. 26 K None No Power Seat 26 K is a standard recliner Premium Economy Class seat. 27 A None No Power Seat 27 A is a standard recliner Premium Economy Class seat, however, the proximity to the lavatories may be bothersome. 27 C None No Power Seat 27 C is a standard recliner Premium Economy Class seat, however, the proximity to the lavatories may be bothersome. 27 D None No Power Seat 27 D is a standard recliner Premium Economy Class seat, however, the proximity to the lavatories may be bothersome. 27 E None No Power Seat 27 E is a standard recliner Premium Economy Class seat, however, the proximity to the lavatories may be bothersome. 27 F None No Power Seat 27 F is a standard recliner Premium Economy Class seat, however, the proximity to the lavatories may be bothersome. 27 G None No Power Seat 27 G is a standard recliner Premium Economy Class seat, however, the proximity to the lavatories may be bothersome. 27 H None No Power Seat 27 H is a standard recliner Premium Economy Class seat, however, the proximity to the lavatories may be bothersome. 27 K None No Power Seat 27 K is a standard recliner Premium Economy Class seat, however, the proximity to the lavatories may be bothersome. 3 A None No Power Seat 3 A is a standard flat bed Royal Laurel seat. 3 D None No Power Seat 3 D is a standard flat bed Royal Laurel seat. 3 G None No Power Seat 3 G is a standard flat bed Royal Laurel seat. 3 K None No Power Seat 3 K is a standard flat bed Royal Laurel seat. 45 A None No Power Seat 45 A is an Economy seat with extra leg room due to emergency exit row ahead. The tray table is in the armrest making the armrest immovable and slightly reducing seat width. There is no floor storage during takeoff and landing. Proximity to the lavatories may be bothersome. 45 B None No Power Seat 45 B is an Economy seat with extra leg room due to emergency exit row ahead. The tray table is in the armrest making the armrest immovable and slightly reducing seat width. There is no floor storage during takeoff and landing. Proximity to the lavatories may be bothersome. 45 C None No Power Seat 45 C is an Economy seat with extra leg room due to emergency exit row ahead. The tray table is in the armrest making the armrest immovable and slightly reducing seat width. There is no floor storage during takeoff and landing. Proximity to the lavatories may be bothersome. 45 H None No Power Seat 45 H is an Economy seat with extra leg room due to emergency exit row ahead. The tray table is in the armrest making the armrest immovable and slightly reducing seat width. There is no floor storage during takeoff and landing. Proximity to the lavatories may be bothersome. 45 J None No Power Seat 45 J is an Economy seat with extra leg room due to emergency exit row ahead. The tray table is in the armrest making the armrest immovable and slightly reducing seat width. There is no floor storage during takeoff and landing. Proximity to the lavatories may be bothersome. 45 K None No Power Seat 45 K is an Economy seat with extra leg room due to emergency exit row ahead. The tray table is in the armrest making the armrest immovable and slightly reducing seat width. There is no floor storage during takeoff and landing. Proximity to the lavatories may be bothersome. 46 D None No Power Seat 46 D is an Economy seat that may have limited legroom due to positioning of the bulkhead wall ahead. The tray table is in the armrest making the armrest immovable and slightly reducing seat width. There is no floor storage during takeoff and landing. This is a bassinet location so passengers with infants are often seated in this area. 46 E None No Power Seat 46 E is an Economy seat that may have limited legroom due to positioning of the bulkhead wall ahead. The tray table is in the armrest making the armrest immovable and slightly reducing seat width. There is no floor storage during takeoff and landing. This is a bassinet location so passengers with infants are often seated in this area. 46 G None No Power Seat 46 G is an Economy seat that may have limited legroom due to positioning of the bulkhead wall ahead. The tray table is in the armrest making the armrest immovable and slightly reducing seat width. There is no floor storage during takeoff and landing. This is a bassinet location so passengers with infants are often seated in this area. 49 D None No Power Seat 49 D is an Economy Class seat that may have restricted legroom due to the presence of an entertainment equipment box. 5 A None No Power Seat 5 A is a standard flat bed Royal Laurel seat. 5 D None No Power Seat 5 D is a standard flat bed Royal Laurel seat. 5 G None No Power Seat 5 G is a standard flat bed Royal Laurel seat. 5 K None No Power Seat 5 K is a standard flat bed Royal Laurel seat. 56 C None No Power Seat 56 C juts into the aisle and is often bumped from behind by service carts and other passengers moving about the cabin. 56 H None No Power Seat 56 H juts into the aisle and is often bumped from behind by service carts and other passengers moving about the cabin. 57 A None No Power Seat 57 A may have limited recline due to the wall directly behind. Proximity to the lavatory and galley may be bothersome. 57 C None No Power Seat 57 C may have limited recline due to the wall directly behind. Proximity to the lavatory and galley may be bothersome. 57 D None No Power Seat 57 D may have limited recline due to the wall directly behind. Proximity to the lavatory and galley may be bothersome. 57 E None No Power Seat 57 E may have limited recline due to the wall directly behind. Proximity to the lavatory and galley may be bothersome. 57 G None No Power Seat 57 G may have limited recline due to the wall directly behind. Proximity to the lavatory and galley may be bothersome. 57 H None No Power Seat 57 H may have limited recline due to the wall directly behind. Proximity to the lavatory and galley may be bothersome. 57 K None No Power Seat 57 K may have limited recline due to the wall directly behind. Proximity to the lavatory and galley may be bothersome. 6 A None No Power Seat 6 A is a standard flat bed Royal Laurel seat whose proximity to the lavatory may be bothersome. 6 D None No Power Seat 6 D is a standard flat bed Royal Laurel seat. 6 G None No Power Seat 6 G is a standard flat bed Royal Laurel seat. 6 K None No Power Seat 6 K is a standard flat bed Royal Laurel seat whose proximity to the lavatory may be bothersome. 60 A None No Power Seat 60 A is an Economy seat with extra leg room due to emergency exit row ahead. The tray table is in the armrest making the armrest immovable and slightly reducing seat width. There is no floor storage during takeoff and landing. Proximity to the galley may be bothersome. 60 B None No Power Seat 60 B is an Economy seat with extra leg room due to emergency exit row ahead. The tray table is in the armrest making the armrest immovable and slightly reducing seat width. There is no floor storage during takeoff and landing. Proximity to the galley may be bothersome. 60 C None No Power Seat 60 C is an Economy seat with extra leg room due to emergency exit row ahead. The tray table is in the armrest making the armrest immovable and slightly reducing seat width. There is no floor storage during takeoff and landing. Proximity to the galley may be bothersome. 60 H None No Power Seat 60 H is an Economy seat with extra leg room due to emergency exit row ahead. The tray table is in the armrest making the armrest immovable and slightly reducing seat width. There is no floor storage during takeoff and landing. Proximity to the galley may be bothersome. 60 J None No Power Seat 60 J is an Economy seat with extra leg room due to emergency exit row ahead. The tray table is in the armrest making the armrest immovable and slightly reducing seat width. There is no floor storage during takeoff and landing. Proximity to the galley may be bothersome. 60 K None No Power Seat 60 K is an Economy seat with extra leg room due to emergency exit row ahead. The tray table is in the armrest making the armrest immovable and slightly reducing seat width. There is no floor storage during takeoff and landing. Proximity to the galley may be bothersome. 61 D None No Power Seat 61 D is an Economy seat that may have limited legroom due to positioning of the bulkhead wall ahead. Proximity to the galley may be bothersome. The tray table is in the armrest making the armrest immovable and slightly reducing seat width. There is no floor storage during takeoff and landing. This is a bassinet location so passengers with infants are often seated in this area. 61 E None No Power Seat 61 E is an Economy seat that may have limited legroom due to positioning of the bulkhead wall ahead. Proximity to the galley may be bothersome. The tray table is in the armrest making the armrest immovable and slightly reducing seat width. There is no floor storage during takeoff and landing. This is a bassinet location so passengers with infants are often seated in this area. 61 G None No Power Seat 61 G is an Economy seat that may have limited legroom due to positioning of the bulkhead wall ahead. Proximity to the galley may be bothersome. The tray table is in the armrest making the armrest immovable and slightly reducing seat width. There is no floor storage during takeoff and landing. This is a bassinet location so passengers with infants are often seated in this area. 68 C None No Power Seat 68 C juts into the aisle and is often bumped from behind by service carts and other passengers moving about the cabin. 68 H None No Power Seat 68 H juts into the aisle and is often bumped from behind by service carts and other passengers moving about the cabin. 7 D None No Power Seat 7 D is a standard flat bed Royal Laurel seat whose proximity to the lavatory and galley may be bothersome. 7 G None No Power Seat 7 G is a standard flat bed Royal Laurel seat whose proximity to the lavatory and galley may be bothersome. 71 A None No Power Seat 71 A is in the last row of the aircraft and may have limited or no recline due to the wall behind. Proximity to the lavatory and galley may be bothersome. 71 C None No Power Seat 71 C is in the last row of the aircraft and may have limited or no recline due to the wall behind. Proximity to the lavatory and galley may be bothersome. 71 D None No Power Seat 71 D is in the last row of the aircraft and may have limited or no recline due to the wall behind. Proximity to the lavatory and galley may be bothersome. 71 E None No Power Seat 71 E is in the last row of the aircraft and may have limited or no recline due to the wall behind. Proximity to the lavatory and galley may be bothersome. 71 G None No Power Seat 71 G is in the last row of the aircraft and may have limited or no recline due to the wall behind. Proximity to the lavatory and galley may be bothersome. 71 H None No Power Seat 71 H is in the last row of the aircraft and may have limited or no recline due to the wall behind. Proximity to the lavatory and galley may be bothersome. 71 K None No Power Seat 71 K is in the last row of the aircraft and may have limited or no recline due to the wall behind. Proximity to the lavatory and galley may be bothersome. 8 A None No Power Seat 8 A is a standard flat bed Royal Laurel Class seat however, light and noise from the galley may be bothersome when trying to sleep during flight. 8 D None No Power Seat 8 D is a standard flat bed Royal Laurel Class seat however, light and noise from the galley may be bothersome when trying to sleep during flight. 8 G None No Power Seat 8 G is a standard flat bed Royal Laurel Class seat however, light and noise from the galley may be bothersome when trying to sleep during flight. 8 K None No Power Seat 8 K is a standard flat bed Royal Laurel Class seat however, light and noise from the galley may be bothersome when trying to sleep during flight. 9 A None No Power Seat 9 A is a standard flat bed Royal Laurel seat. 9 D None No Power Seat 9 D is a standard flat bed Royal Laurel seat. 9 G None No Power Seat 9 G is a standard flat bed Royal Laurel seat. 9 K None No Power Seat 9 K is a standard flat bed Royal Laurel seat. Eva Airways offers audio selections in all classes of service. Each seat is equipped with a personal television with Audio and Video on Demand. Royal Laurel class seats are equipped with personal 110v power ports and Premium Economy class seats are equipped with personal 110v power ports located in the armrests. Eva Airways currently has 15 B777-300ER (extended range) aircraft in their long-haul twin-aisle fleet and is in the process of adding seven additional B777-300ER aircraft, increasing frequency to mainland China and new destinations in North Asia. This three-class configuration of EVA Airways Boeing 777-300ER seats a total of 313 passengers. This version of the B777-300ER has three classes of service: Royal Laurel (EVA's newest class), Premium Economy, and Economy. In Economy, each C, D, and H seat has limited underseat storage and legroom due to the presence of an entertainment equipment box. Leg room was not bad, but I found that being that close to the galley there were constantly other guests standing around and flight attendants coming and going made it difficult to fall asleep on a 10 hour + trip from Taipei to Vancouver. The dinner offering was quite disappointing with chewy overdone chicken is some sort of a mystery white sauce and the vegetables were a total overcooked mushy mess. Otherwise the entertainment offerings and new updated options and screens were pleasant surprize ! I find this business class the least comfortable of any. The opening to get in/out of seat is tiny, so the seat has to be upright to do it. The foot rest does not go far enough when sitting, does not connect with shelf, so leg is hanging. There is no place to put anything like reading materials, computer, etc. But most of all as a 75-year-old traveler I worry that if the electric system fails in an emergency I would not be able to upright my seat; not get out of the seat at all. Liked the old EVA configuration better. In the premium economy section the seats actually recline pretty far. I prefer the last row because there is a bulkhead behind you and you can recline very deep without bothering anyone behind you. Seats E and F can be difficult to climb in and out if the people next to you are sleeping. I prefer the aisle. Standard economy seat far enough away from children at the bulkhead and also noise from the toilets. Good in-flight entertainment system. Cabin crew were very attentive for economy. The toilets, with complimentary amenities, were kept immaculate even though the flight was full. Also, plenty of space to stand in the galley end at the tail. My only complaint is that it was a day flight from Bangkok to London and they dimmed all the lights and shut the window blinds. I would have preferred if they had kept the cabin in day mode as we arrived at Heathrow at 7.30 in the evening. I have flown many other carriers to the Far East and will certainly fly them again. I love flying this plane with EVA. Service is attentive and friendly. Royal Laurel is excellent, but be aware that seats in row 8 (and probably row 1, though I haven't tried it) are shorter because of the bulkhead. I'm only 5'8", and my feet hit the end when fully flat unless I slide as far as possible towards my head. Even then my feet feel cramped. This isn't the case at all in the other rows. I like the back section (rows 8-11) during the flight just because it feels cozier with only 4 rows, but be aware that during boarding all of economy and economy plus passengers walk through this section. Boarding will be much quieter in rows 1-7. A majority of passengers walk up the left aisle, so seats G or K will be a little quieter in this back section too. But anyway, after boarding is complete this section is very nice. My only other complaint is the lack of at-hand storage in Royal Laurel. Everything, even a small backpack, has to go overhead during takeoff and landing, and during the flight there really isn't anywhere to put it except under your feet. There is a shelf beside you where you can put small items during the flight, but watch out if there is any turbulence! A minor point considering the comfort of these seats. Nice seat, great service, good food. 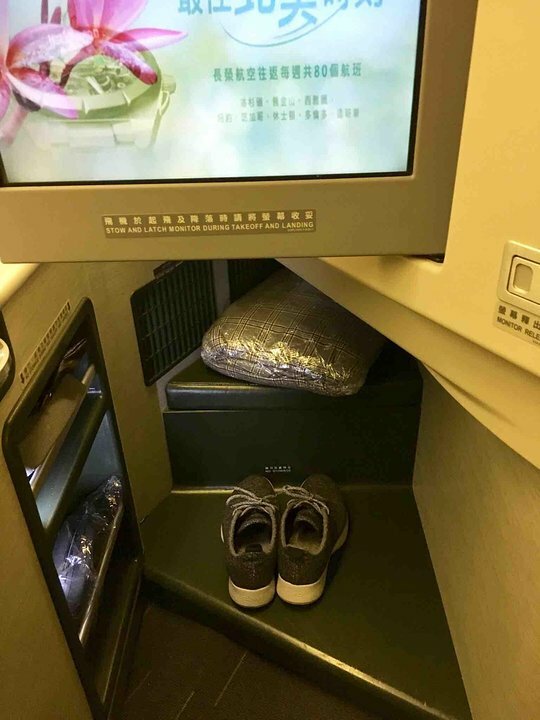 52K in economy was terrible seat for long flight from Taipei to Seattle. The placement of the metal leg for the seat in front came down about 2/3 of the width of the space so impossible to stretch out legs unless placed at angle. While it was a window seat there was a deep window well where a person would lean their head while sleeping. Overall extremely uncomfortable for long night time flight. What an amazing airline! I flew in Business Class from Toronto to Taipei, Taipei to Bangkok, Taipei to Toronto (all 777's) and Hanoi to Taipei (321) and I cannot write enough good things about this airline. Check-in was a breeze, the counter staff were were friendly and the the FA's were just amazing. They were really nice and always had smiles. The aircraft looked like they were just about brand new (especially the 321) and the seats were comfortable. The amenity kit was fine and the pajamas were a really nice touch. The toilets were always super clean, the movies and shows on the IFE systems were up to date and the food (and drink) were first rate. I would definitely fly this airline in a heartbeat. It was really a great experience. And, the Infinity Lounge in the Taipei airport was to die for. I would love to have the shower room in my house! BR 05 LAX-TPE. EVA business class is still the best-kept secret for travel to Asia. The seats are very comfortable, as is the bedding. 11A is the last row of business, Elite (Prem Eco) is right behind and was very quiet with little/no traffic going by. There are no galleys are lavs near here. Very nice amenities. The food is quite good most of the time (occasional misses). The service is very good as well. My only serious complaints are the bathrooms. The one between the two business section is great: larger, very clean. The ones up front are more standard sized bathrooms, and despite looking clean, have a smell that I can only call "swampy." AMS-BKK and return in the new 77M interior where Elite has no leg rest in the chair but a foot rest on the chair in front of you. However the first row of Elite (row 20) does have a leg rest which makes it the best seats in Elite in my opinion. 11" video touch screen, great service. No problems at all with this seat. Slept for 8 hours London to Bangkok. Drinks, whatever you fancy. But food,I am a vegetarian. Only one option for meal.I have travelled about twenty times on this route and every flight I get the same meal. It verges on inedible. I once went for the standard offering hoping to pick out something, no luck. For meat eaters plenty of choice, for us veggie freaks no choice. Standard seat on wing. Ample leg room. Electrical outlet available. My husband and i were seated in 3A, and 5A for our Singapore to Taipei, then on to Toronto, all on this aircraft. I have nothing but WONDERFUL comments regarding these flights. The seats were comfortabe, meals were lovely, flight attendants were attentive when they needed to be, and let us sleep when we needed. Flights were on time, efficiently boarded. The cleanliness of this aircraft was the standout for me. The washrooms looked like they were cleaned after every time they were used. Nice touches such as toothbrush, toothpaste, washcloths helped easy the the lenght of the flight. PJ's were also provide for those who wanted. A comfortable quilt and quilted seat covering were provided for our sleeping comfort. I definetly recommend this plane, and absolutely this airline. EVA Air has become my favorite airline. The seat was comfortable, spacious with ample leg room. I was even able to stretch my legs fully under the seat in front of me, and there was no metal box under the chair. I think this may be a newer plane. Although, I did encounter it on a smaller flight from Bangkok to Taipei, luckily on the aisle it was not a problem. In retrospect, I would try to get a seat on row 45 because the lavatory is walled off and you have a lot of space in front with no obstruction, especially H J K. The flight crew were amazing and seemed to work as one unit, the food was good and the entertainment console has a huge screen with a large international variety of current cinema and television. The free extras included toothbrushes, eye masks and toiletries (to be found in the lavatories) that made the 15 hr flight all the smoother. We fly this plane almost every year in Elite-Class from San Francisco to Taipei. This year they removed the extendable leg-rest and only provide a small pulldown metal plate on the seat ahead to put your feet on. There is no ability to adjust the plate and it made for a disappointing and less comfortable flight for 14 hours. I really miss the adjustable, extendable leg-rest. Oddly the extendable leg-rest was back on the continuing flight from Taipei to Bangkok. Same type of plane. But the flight is only 3.5 hours long. Very comfortable seat and lots of leg room. Was nice to have an overheard bin to myself as well. Seat reclined to a flat horizontal position and along with the super comfy pillow and down comforter, I was able to sleep for a solid 6 hours. All of the food was excellent and beautifully presented. Wine selection was great. Cabin crew went above and beyond to make the flight enjoyable and safe. Kudos to the flight crew as well. We left on time, arrived on time and the flight and landing were smooth. Nice sized entertainment screen and wide selection of things to watch. The amenities kit, pajamas and slippers were a nice touch. I liked being able to keep my street clothes from getting wrinkled on a 14 hour flight. Looking forward to my next trip to Thailand! The Elite seats have a feature that causes the lower part of the seat (behind the legs) to extend upward, lifting the leg. I am 5' 9". It was miserable because when it was up, the TV box under the seat was where my toes wanted to be. I had to squeeze them over on one side. It's ok for a 4hr flight, but for a 14hr flight from LAX-TPE it was miserable. Recently flew this "Hello Kitty" flight and loved it. I'm a big person (5'11", 280 lbs), so I pay for a bigger seat & more legroom. As this flight is scheduled for 16.5 hrs, it's well worth it. I was tempted to upgrade to business-class, prior to the flight; but, I found that Elite Class was good-enough. In 4 RT flights w/ EVA Air, over the last 8 yrs, we've never been disappointed w/ the equipment, nor w/ their service. Love their 777-300ER aircraft, too. They're #1 choice for us! I was very disappointed to find a large, metal Inflight Entertainment box under the seat in front of me. This seat is in the so-called "Evergreen" class, which is supposed to offer more legroom, and for which I paid a considerable premium compared to regular economy. But these metal boxes under the seats really restrict legroom. Looking around, I saw these boxes under almost every seat, so they'd be hard to avoid. I'd avoid EVA until they can get rid of them. Otherwise, its a fine airline. There is less under seat storage due to a metal box (A/V equip or life jacket?) for the set in front of it. 11D SFO-TPE and 9K TPE-NRT. Absolutely no issue with noise or traffic from behind while in row 11. The seats are very comfortable, both in sitting/reclining and in flat position. It is a little difficult to get out unless the seat is completely upright. The window seats face outward and feel a little more private. Food was good/average, but the service was lovely. 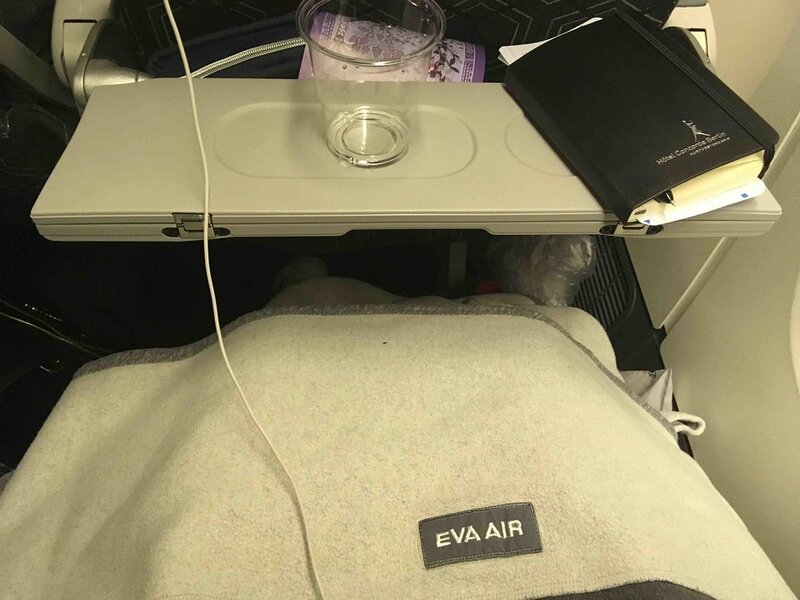 I'd fly EVA anytime - one of the best values for business class I've ever gotten. Nice staff and very nice lounge. Eva big let down is its food. Choice is awful. Breakfast disgusting. Had better in economy in other airlines. If you expext international customers serve international food. Otherwise nice package. Seat okay. Cathay pacific far far better. Elite - the premium economy product - is the best premium economy deal in the sky. Far surpasses any US airline and better than the seats of BA or AF. Recline was sufficient to actually sleep, video monitor was huge (larger than ipad), food was decent, service attentive. Highly recommended. In Elite Class (Premium Economy), there is an AVOD type box under each seat. 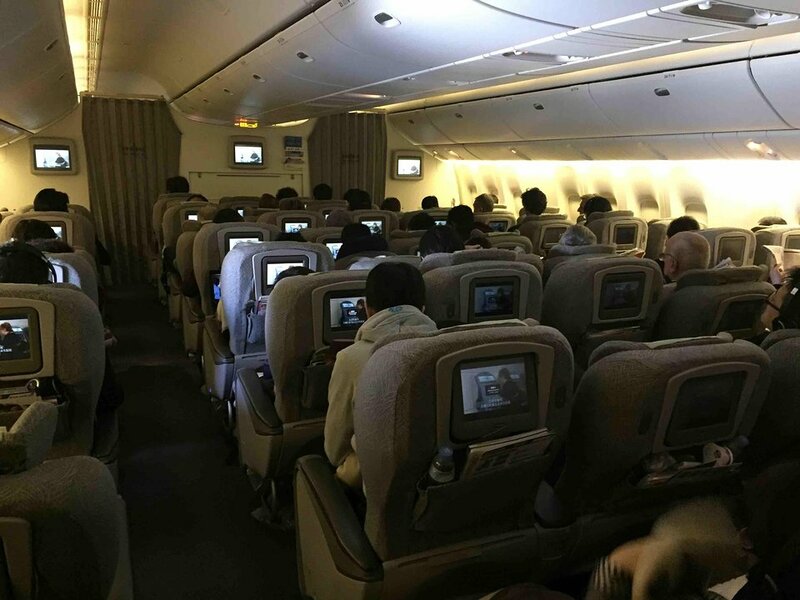 In seats A, E,F, and H (window and middle seats), there is a large AVOD box. In seats C, D, G, and K (Aisle seats), there is a small AVOD box. In the middle section (D, E, F, and G), there is a seat post under each seat. In the outside sections, the two seat posts are on the outside, leaving a large open space in the middle. That makes the middle seats of the middle section exceptionally restricted in leg room. 'There is no window at this seat" This is completely untrue. there is one window at your seat compared to two for the other seats and the seat was very comfortable for a 13-hour or so flight. Would fly business class next time because I don't like the seat as much as a regional business class seat. Service is also just economy. Passengers from economy keep on using the Elite toilet even though it says "Elite Class Only" and I think that it's just a problem with 200 passengers using 2 toilets for 60 people. When I flew Vietnam Airlines to Tokyo, it was very funny to see no one in economy to come and use the business class toilets. Fairly new 777 with Royal Laurel service From TPE to IAH. Reverse herringbone seating arrangement is great - for single travelers the window seat is ideal. Great service although the "Hello Kitty" theme playing on the monitors was a little annoying before takeoff. The food was very good. Lots of storage space. I enjoy flying with EVA since the schedule out of YYZ is the best. Check in after dinner, take off early the morning, sleep and before you know it you are in TPE. Good food, great service for a good price. Cabin Crew very efficient and great service. Will fly EVA from now on. I like the Chinese breakfast. Awesome Royal Laurel seat, great for sleeping, excellent food. Choice of entertainment limited so just listened to music and watched a few episodes of 'Two and a half men' and kept moving map up. I have flown EVA air before and in my oponion it is the best of the seats available on this route. Service with all of the Asian Airlines is far superior to that I had on BA in December. Whilst SIA leads witht their best Business Seat, these are pretty good. A good trip with good entertainment and service. Please be aware that ALL aisle seats (C and H) in Economy Class Zone 3 (rows 45 to 71) have a metal box under the seats. The metal box houses what appears to be life vests. Consequently, half the space under seats C and H are gone. If you intend to put your carry-on bag under the aisle seat in front of you, please know that the space under the seat is limited by that metal box containing a life vest. Leg room is compromised and limited by the metal box, unlike the window and middle seats. You can squeeze a small backpack under the seat in front of you, sharing the space with the metal box. However, leg room is gone. On short flights, it shouldn't be too much of a hassle. On long haul flights from Asia to North America, it is a serious problem. You can't stretch your legs! I'm 5 feet 8 inches tall. Be forewarned. I fly with EVA for years now on the AMS-BKK-AMS route. EVA has the best leg room and seat width in economy of all carriers who fly from AMS to BKK. Being 6,5' that's very important to me. Seat 63K provides a nice, unobstructed view. Friendly staff, flights always on time and decent meals. I really can't fault them, and that for very reasonable prices! YYZ- TPE The crew was brilliant, very attentive and pampering. I recommend the single window seat if you're traveling alone, you get two windows and extra privacy. The pajamas that they handed out were very comfortable and you can take them with you. The seat was very comfortable to sit in with different reclining positions and lumbar support. The seat lies completely flat with lots of legroom. I'm 5'9", 180# and I slept on my side comfortably. Lots of movies to keep you occupied when awake. Wine selection was limited but of very high quality, especially the champagne. Food, however, was the worst I've ever tasted in a business class in the last 15 years. I ordered my meal online and was disappointed of the very limited selection. The entree was atrocious and the inflight snack was inedible. That is really the only negative. I will definitely fly with them again. An absolutely great flight. Not one negative for EVA Air. This would have to be the best airline I have flown with. Perhaps a tip for anyone fliying on the 777. I find it quite noisy, so prefer to be seated in the centre as it seems quieter. Excellent seat but the seat controls are hard to access as they are beside your elbow. I am a large person but the seats had plenty of room. I was even able to lay on my side despite my size. I agree with the other other reviewer who said the seats need different padding. They seem a bit too hard in the upright position. Excellent food and service from the crew. 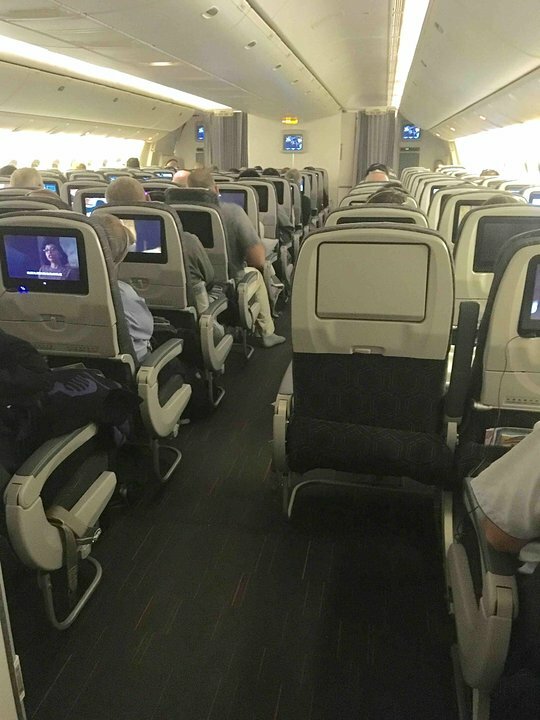 On the 777 - 300 with herringbone royal laurel (v1), all of the seats C, D and H in economy have an entertainment box under the seat, meaning the seat behind has about half as much foot room or underseat stowage space. If you want an aisle in economy, G is the best. I sat on Royal Laurel Class, the seat was very comfortable. I had a lot of space. The flight attendance were great. Good food. Everything was perfect. I've been traveling between LAX and TPE on EVA for years. The older 747 seats were not acceptable as they inclined or older yet didn't even get flat. The new 777 jets with the 1-2-1 seating in Royal Laurel class are excellent. Make sure you get the flights with this seating, not the 2-2-2. At 6'1" 230 lbs I like a bit of room. And I get it. I can sleep, roll over, find different positions on the seat. It could be better padded but for me I usually sleep a good 8 hours of the flight. Food with EVA is just OK. To be honest I'm not starved flying anyway. Nor do I drink much on a jet but it is available and a decent enough selection and quality. The entertainment system seems adequate with enough movies to while away the hours I am awake. I guess overall I must be satisfied as I continue to fly them on this route. 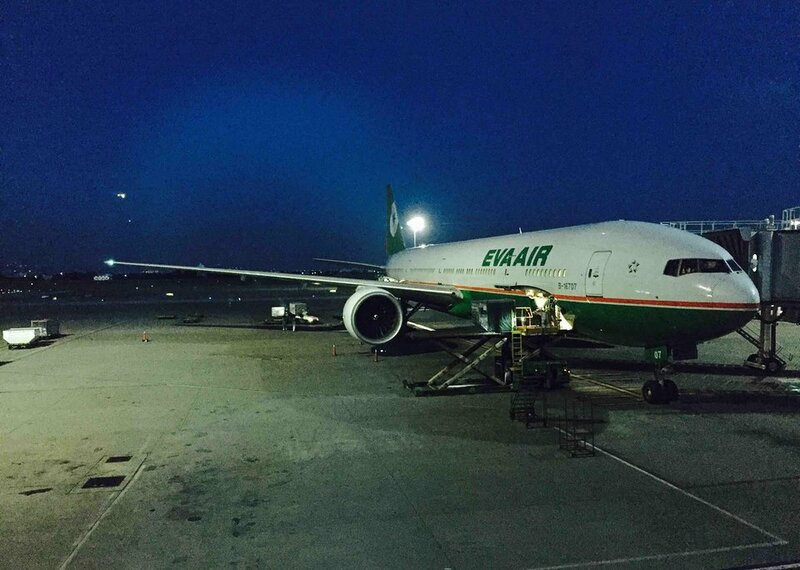 EVA Air flies 4 versions of Boeing 777-300ER.